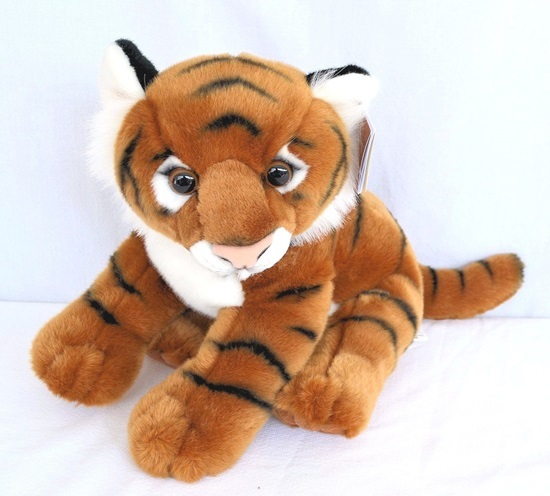 This 14" plush Bengal tiger is very soft and huggable. This plush Bengal tiger is very soft and huggable. He is made up of a brown plush fur, with white plush fur lining the inside of his ears, and his snout, and white "sideburns" line his face. He has a pink plush nose, with airbrushed detailing throuhout his body. He is 14 inches long, and surface washable. Good for ages 3 and up. He is from Aurora's Miyoni Jungle Animals Collection.